This image was taken from a slide dated “September 1970,” probably taken by “Doc” Doggett. Doc was the unofficial CAP 2 photographer since he had the best camera and was our best photographer. I often used his camera and we traded slides and prints. 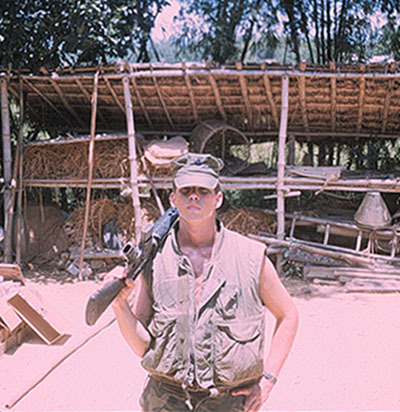 I’m betting this photo was taken as I returned from a daytime patrol, since I’m sweating and dressed in standard daytime patrol gear — utility cap, flak jacket, long pants, M-16. I’m standing in the dirt courtyard of one of our day sites, with a farmer’s bamboo and thatch storage shed in the background.